In order to officially be referred to as Champagne, the bubbly needs to be from the Champagne region of France and made in accordance with specific guidelines referred to as ‘Methode Champenoise.’ Basically, this procedure means the bubbles come from a secondary fermentation in the bottle rather than carbonation. This strict process requires aging of at least 15 months, which means that the Champagne is kept in the bottle with the sediment that forms and is gradually turned and inverted until it’s time for the sediment to be removed. Vintage Champagne requires it be cellared for three years or more before the sediment that gathers in the bottle’s neck is removed. Three grape varieties are blended in a process called “assemblage”: Pinot Noir, Pinot Meunier and Chardonnay. The traditional French method also requires the bottles to be turned, or riddled, by hand. If it’s from France, but not from the Champagne region, it is often referred to as Cremant. Despite the strict labeling laws, many use the word Champagne as a generic term and associate the iconic wine with the lavish lifestyle of the rich and famous. If you’re searching for a more affordable style, both Prosecco and Cava are similar yet usually less expensive. Prosecco is a sparkling white wine made with Glera grapes, grown in the Veneto region of Italy. It has a past reputation of being sweet and low quality, but that’s old news as today’s Prosecco, made with modern methods, is often indistinguishable from Champagne. With Prosecco, the Italian Charmat method is applied in which the second fermentation takes place in steel tanks rather than individual bottles. Cava is a Spanish sparkling wine that can either be white or rose. Like Champagne, in order for it to be called Cava, it needs to be from a specific region and be made in a particular way. In Spain, most Cava comes from Catalonia and is made in a similar way to Champagne. Freixenet and Codorniu are the grape varieties most commonly used in Cava. In terms of taste, Prosecco is arguably the closest Champagne knock-off and an ideal and agreeable aperitif to greet you at a party. Prosecco is usually quite fruity, but varies in regards to sweetness or dryness. Prosecco is soft and approachable. In comparison, Cava typically has more bubbles and a less sweet flavor. One can expect Cava to have a hint of citrus and at times an earthy essence. Cava makes a fantastic nightcap or post dinner indulgence. Returning to North America, domestic bubbly is referred to as Sparkling Wine and is made with various methods, from mimicking France’s traditional method to Italy’s Charment method. There is no restriction on time in the bottle and favorable climates, especially in California and Washington states, which allow for a vintage wine to be produced almost every year. Current U.S. regulations banned the term “Champagne” from any wine produced outside the coveted French region after 2006. In Washington state, there are over 760 wineries, yet less than 10 make sparkling wine. This could be because Americans associate the festive wine only with special occasions, rather than as an everyday wine. This thinking is due for a change as any day can be a sparkling one. As early as 1984, Mountain Dome Winery in Spokane began producing a high quality sparkling wine utilizing Methode Champenoise, which included hand riddling and bottle aging from two to seven years. Mountain Dome’s Brut with the whimsical gnome label (nicknamed Gnome Perignon) is a quality everyday sparkler that retails for under $18 a bottle. Don Townshend of Townshend Cellars recently purchased Mountain Dome, retaining second-generation winemaker Eric Manz. The sparkling wine can currently be tasted at the new Townshend Tasting room in the Green Bluff area of North Spokane. Another Washington state option is Karma Vineyards, which is located off the south shore of Lake Chelan. Karma Vineyards opened in 2007 and, like Mountain Dome, is producing quality sparkling wines also using the Methode Champenoise. Karma Vineyards has 14-acres of vineyards and an underground wine cave that provides great temperature control for the bottles, as well as good acoustics. The winery has blossomed into a popular place for weddings and soirees. 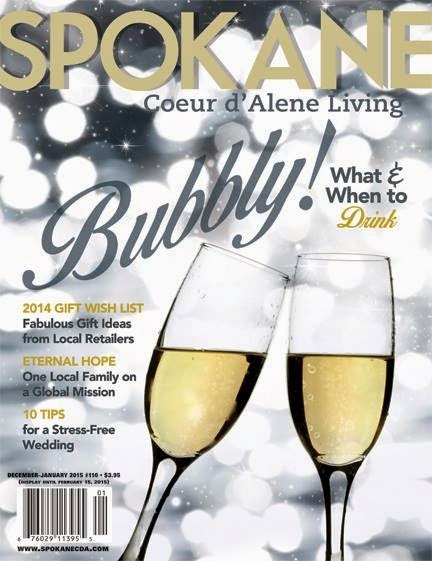 If you still want to explore your bubbly options, go see John Allen at Vino! located just off 2nd Avenue on Washington Street in downtown Spokane, or Matt Dolan at the Rocket Market, atop Spokane’s South Hill off of 42nd Avenue. These knowledgeable wine guys can recommend bubbly at all price points from pretty much any region. Both Vino! and The Rocket Market have popular wine classes and tastings to further your knowledge of bubbles, the happiest wine you can pour. common style, with no sweetness. Extra Dry has 12-20 grams of sugar, giving a hint of sweetness. It gets sweeter as you move to Sec with 17-35 grams and Demi-Sec with 33-55 grams. The last stop is Doux, with more than 55 grams, which is considered dessert wine. Americans tend to reserve bubbly for special occasions but since quality bubbly can be found under $15 a bottle, we need to take another hint from the French and consider it an everyday wine.